The 16' Gold Medalist XL is comparable in performance, quality, and safety to our best quality rectangular trampolines. The 16' size has an extremely large jumping surface at over 150 Sq. feet. 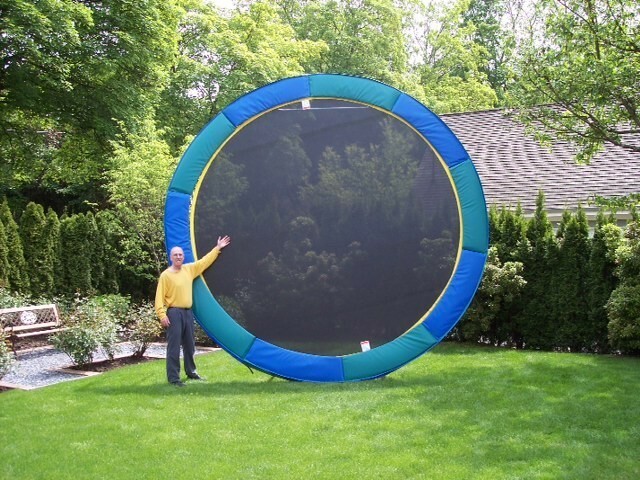 This trampoline makes an excellent choice for the whole family and will provide many years of fun, entertainment, and trouble free service. With its heavy duty construction, it is also recommended for commercial and resort use. This size is also available as a Silver model at $1795. and a Bronze model at $ 1695. Replacement frame pads and jump mat for the 16' Gold XL are $ 595 each. Enclosure sold separately. We offer the 16' trampoline in three models. The Silver is an excellent quality base model. The Bronze is an economy model. The Gold XL has an upgraded frame, jumping surface, and safety pad. JUMPING SURFACE: (Over 150 Sq. Ft.) Sundance sets the industry standard. Made of the highest-grade, high performance, polypropylene mesh, this totally weatherproof fabric can be left outside, sun, rain, or snow. It is designed for permanent outdoor use. SPRINGS: (120-8.5" long) Absolutely the best in the industry! These high performance , heavy duty, galvanized steel springs will last for many, many years. FRAME & LEGS: Heavy duty 5 piece, 12 gauge galvanized steel frame, Legs: 5 - 1 piece U-shaped legs.